Voters in Iowa who plan on attending Monday’s Democratic caucuses will be making a choice between two very different tax policy visions from the leading candidates. This contrast is so stark that it can be expressed pretty simply with a visualization. I’ll first show you a graph that illustrates the differences between former Secretary of State Hillary Clinton and Vermont Senator Bernie Sanders. Then I’ll get to the background: how two candidates with many broad areas of agreement ended up so far apart on the issue of tax policy. 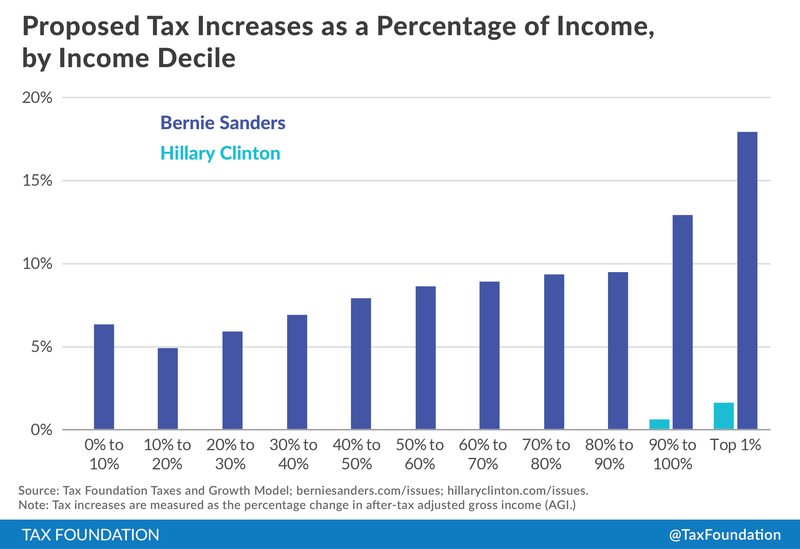 What this graph shows is the approximate tax increases, as a percentage of income, that each kind of person would face under the Sanders tax proposals and under the Clinton tax proposals. Along the horizontal axis, people are divided into ten equal groups, called income deciles. The ten percent of people with the lowest incomes are all the way on the left, and the ten percent of people with the highest incomes are second from the right. 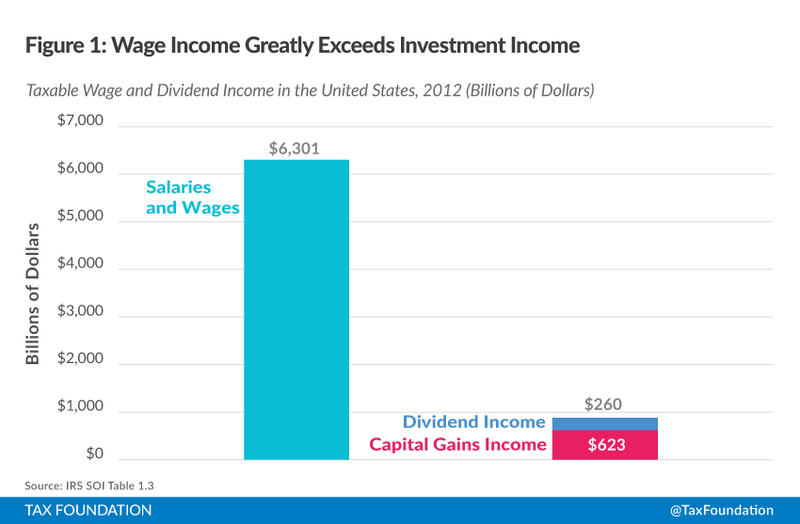 At the very right-most end, we put in a column for the top one percent of income earners, too. What you can see here is that Clinton has taken an approach that only increases taxes, moderately, for the very highest-income taxpayers. In contrast, Sanders has taken an approach that increases taxes on everyone, but increases taxes even more for the highest income taxpayers. The final results show a dramatic difference in total revenue raised. Our analysis of Senator Sanders’s plan shows it raising tax revenues by $13.6 trillion over ten years, while our analysis of Secretary Clinton’s plan shows it raising revenues by only $498 billion. Sanders has campaigned on a variety of spending programs for things like health care and family leave, and the Clinton campaign has asked the very fair question of how these programs would be financed. To his credit, Sanders has responded with detailed tax proposals that would, indeed, raise substantial revenue. However, in order to make the numbers add up, he has had to propose raising taxes on many Americans whose taxes would not be raised under Clinton’s proposals. This was, of course, why the Clinton campaign put so much focus on the issue of tax policy in the first place. An interesting question here is why a progressive lawmaker like Sanders would raise taxes on lower-income Americans—the group of Americans he is most focused on helping—and expose himself to this line of attack. The answer is that he has no choice. I have loosely described a sort of progressive trilemma in tax policy. Ideally, progressives would like to serve three priorities: (1) not increasing the deficit (2) increasing taxes only on capital income or high income earners (3) creating many new spending projects. Furthermore, while it’s undeniable that millionaires and billionaires have lots of money, the truth about income in America is that an even vaster majority of income goes to people who consider themselves “middle class.” When President Obama pledged to avoid tax increases on people making less than $250,000 a year, he removed about 98 percent of Americans from his potential tax base. This strategy simply doesn’t yield the kinds of revenue that some progressives hope it will. 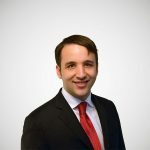 You can’t exempt junior investment bankers, associates at big law firms, and computer programmers in Silicon Valley from new tax increases, and still expect to raise substantial revenue. As a result of the self-imposed constraints on tax policy, President Obama has not been able to raise much in the way of new revenues. Without new revenues, Obama has presumably had to sacrifice some of the new spending programs he would like to have implemented. In other words, in the progressive trilemma, he has chosen to sacrifice priority (3), and by all indications, it looks like Hillary Clinton will be doing the same. In contrast, Bernie Sanders has boldly abandoned priority (2) of the progressive trilemma instead. While he does increase taxes significantly on the wealthiest Americans, he also raises taxes to a lesser degree for everyone else. In truth, the kind of social democratic model that Sanders espouses has always been implemented with a much higher tax burden on the middle class, including large taxes on broad bases like consumption and payrolls. The Obama and Clinton view of tax policy is almost purely a redistributive one; while they are willing to use tax policy to increase federal revenues from the highest-income Americans, their overall zeal for tax increases is limited. Rather than collecting money for federal spending, they instead have a revealed preference for leaving money in the hands of the middle class. They even take a fairly generous view of “middle class,” extending it to include people with 96th or 97th percentile incomes. This view has its benefits, but it places strong constraints on the scope of the federal government. Frustrated by those constraints and eager to propose new spending, Bernie Sanders is sharply departing from that doctrine.